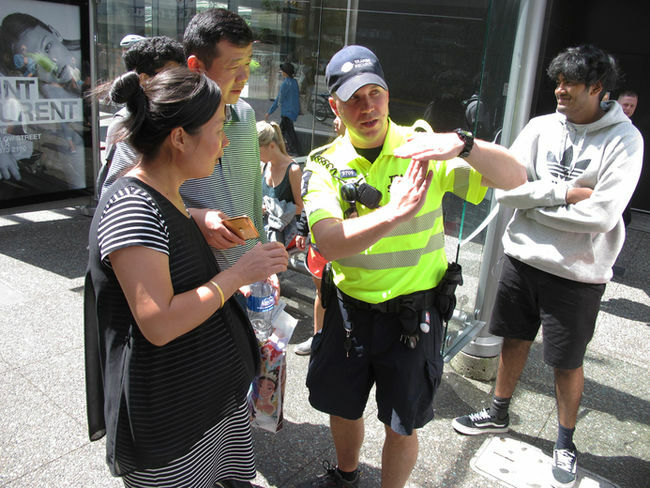 TransLink has dedicated two security officers on bikes to patrol the 44 bus routes in downtown Vancouver — riding on the success of a pilot project. TransLink’s transit security can usually be found in vehicles as they follow and board buses. Vehicle-based security is the preferred option in the suburbs considering how bus stops can be kilometres away from each other. But downtown’s dense service area has some stops with buses arriving every few seconds — and many stops located only seconds apart — while crowds of transit users mill about. For TransLink, this is where the bike patrol’s strengths shine. Joe Stark and Leigh Bates work full-time on bikes — typically from 11 a.m. to 9:30 p.m., throughout downtown, during the summer months. They board an average of more than 100 buses per day. They don’t have to travel far, either. The officers told 24 hours during a bike-along tour last week that they pedal about 20 kilometres a day on bicycles loaned from Transit Police. Typically, their route includes Burrard, Granville and Hastings streets, with strategically chosen buses. As the team departed from a meeting point at Waterfront Station, it became clear that the primary job wasn’t to write tickets, or investigate crime or vandalism — though they can be dispatched in emergencies — but rather to be a familiar face for transit users. Each time the officers pass a bus, eye contact is made. Typically, a signal that everything is OK on the bus is traded. During quieter stretches, they stop to greet an area’s panhandler, to establish a rapport. In crowded areas, they become what Bates calls “walking information booths,” switching between boarding buses for a quick chat, and giving directions. “I’ll walk up and down the line and ask, ‘excuse me, sir, excuse me, ma’am, do you know what bus you’re going on,’” Bates said. Bates said he was drawn to taking on the position since he’d previously lived downtown and knew the area. For Stark, his reasons had more to do with improving physical health. “The majority of our calls are alcohol or mental-health related,” said Stark, who is also a trained suicide interventionalist. “If you ride by someone that’s sitting at a bus stop, you ride back and they’re still there but the bus has already come by, then you talk to them. Shortly after those comments, Stark approached a man sitting under a tree on Granville Street — the man said he was waiting for a bus to downtown (he was already in downtown), but appeared OK and didn’t require medical help. Stark moved on. Minutes later, at the Granville and Georgia intersection, the officers received an alert from dispatch. A teen had gone missing from Children’s Hospital and could be on a bus — a description was passed around. It’s a bit of a phenomenon, but Stark often finds missing people on buses. Patrolling for fare evasion is also a part of their job. Typically, however, just boarding a bus is enough to convince evaders to leave. “We ask them to step off the bus, so the bus can be on its way and we can have a one-on-one with them. It’s a lot of fare advising,” Bates said. More recently, the officers have encountered groups of Pokemon Go players. One particularly memorable incident, Stark said, was a group he approached after seeing them remain on board a SeaBus for several trips without getting off. When he investigated, the group said they were attempting to catch water Pokemon while ferrying back and forth. TransLink spokesman Chris Bryan said bike patrol officers receive a four-day bike-specific course, in addition to basic and advanced security training, and first-aid training. “Total cost for the bike patrol program is less than $10,000 annually, with the majority of the cost related to uniforms and cycling gear,” he said by email. Bike patrol was also briefly tried in Surrey City Centre in July, but Bryan said there are no plans to expand out of downtown Vancouver.